The rich constellation Perseus is packed with sights that offer amateur astronomers many hours of pleasant stargazing on a northern winter night. Named after the great hero of Greek mythology, Perseus lies in the starry plane of the Milky Way Galaxy where thousands of brilliant blue-white stars have coalesced in the last few tens of millions of years. Here you'll find, for example, the famous Double Cluster, the Little Dumbbell Nebula (M76), M34, and the California Nebula, a favorite target for astrophotographers. 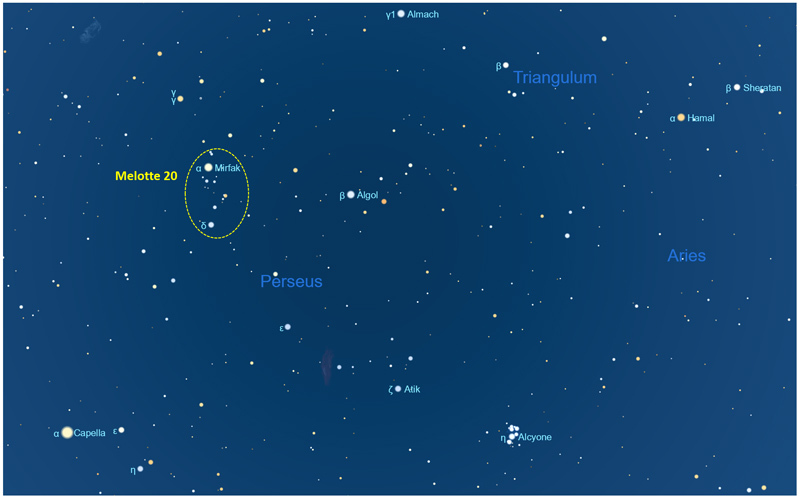 The brightest star in Perseus is 2nd-magnitude Mirfak (Mirphak), or α (alpha) Persei. Its name comes from the Arabic word for "elbow". The star was also important in Hawaiian celestial folklore where it was called Hinali'I and beheld as the point of separation between Earth and Sky as the Milky Way was formed. The star is a yellow-white supergiant (type F5 Ib) nearly nine times the mass of our Sun and 5,000 times as bright. It's about 500 light years away. Perhaps the prettiest and most accessible sight in Perseus is the region around Mirfak. Here you'll find a dazzling collection of associated blue-white stars that make up a loose cluster often called the "Attendants of Mirfak". This little group is visible to the unaided eye in dark sky as a frosting of light around Mirfak. The Attendants of Mirfak are what astronomers call a "moving group", in this case the Alpha Persei Moving Group, which is a collection of stars that formed together and continue to move together through space as they slowly disperse into the galaxy. More formally cataloged as Melotte 20 or Collinder 39, this group of stars is spread across roughly 3° of sky. There are some 40 to 50 stars in the group and they are, on average, some 600 light years away. Mirfak itself is a member of the group. Most visible members of the Alpha Persei Moving Group are massive blue-white stars that make up a much larger conglomeration of stars called the Alpha Persei OB3 Association. There are many X-ray sources here, too, which hints at neutron stars and black holes created by massive stars that have already detonated as supernovae. Most of the group's brightest members lie between the stars α (alpha) Persei and δ (delta) Persei. At least a dozen stars shine brighter than 6th magnitude. In dark sky, look directly towards Mirfak without optics, and you'll see a vaguely luminous region. 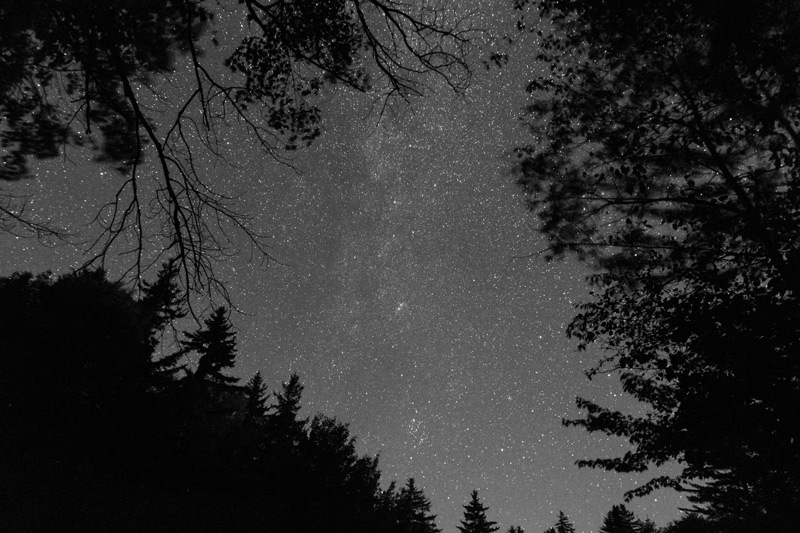 Avert your vision slightly and individual stars will snap into view. Or use a pair of binoculars like the Vixen Super Wide Constellation binoculars or the Kasai Trading Wide Field Binoculars to give your eyes an added boost, while still retaining a wide field, to see this lovely collection of massive stars. In binoculars or a wide-field telescope at low power, Melotte 20 is a beautiful sight. Look directly in and around the region of Mirfak to see a profusion of lovely stars cast about in all manners of shapes and patterns. Look also for a long, winding shape among the brighter stars which resembles a small sea monster - a mini-version of the constellation Cetus, perhaps. The monster's bulbous head is formed by bright Mirfak and a ring of 6th-magnitude stars; σ (sigma) Persei marks the hump of the beast, and δ (delta) marks the tip of the tail. This article is © AstronomyConnect 2018. All rights reserved. jgroub, Nebula and Dave In Vermont like this.